I think I am going to head down there early, like 7, and run 10, then watch the end of LHH and hand out fliers. So, I guess I will commandeer that operation. Wiggy - I think Charlie checked about this and we are "ok" to hand out fliers here....though Charlie can confirm. This is great, we have two men on this operation. I can help out post-LHH. I'm running it very easy, but will seek out Charlie afterwards. I will spearhead the Watergate water station and will look for volunteers (hopefully we have 3-4 people at each stop). We should plan to set up by 8AM and work until about 11. Let me know if you can help. If anyone has a foldup table (preferably two) I'll need it for our station. Jake - let's coordinate getting water, Gatorade powder, cups, ice, coolers/tubs, tables, and sign up forms on the side. I'm sure we can meet at the store Sat AM if not earlier. It looks like Saturday will be a scorcher, so our efforts are well timed. I will run in the evening Saturday because I think it will be too hot in the late AM. Let me know if anyone wants to run in the evening. Yes, worse case scenario, I was thinking you and I could meet at the Store to exchange supplies then break off to our respective stations. I'm getting clarification on handing out fliers after the race, but they're public streets so I don't think I'll lack any leverage there. Charlie, It would be ideal if we got permission to setup right after the water tables post-finish of LHH, but there's also ample space after the finish line to mill about. 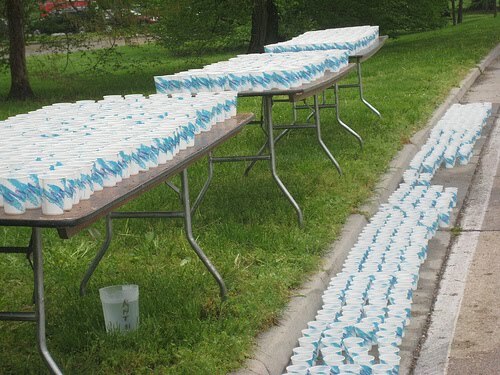 We still need TWO more people for EACH water stop on Saturday. Marren is helping PMurhy and Ian is helping me. We also need two small folding tables. Please reply if you can assist. I'm in. I'm probably going to catch a ride with PMurph, so I can help at the Watergate station.